Service and support are a top priority. At Star CNC we are committed to providing service excellence so our customers can maintain the highest level of productivity. Every machine we sell is supported, including discontinued machines: demo’s and time studies; installations, training, applications assistance; replacement parts; maintenance programs. Factory-trained applications and service engineers are only a phone call or email away and can be dispatched on-site as needed. Our five regional locations maintain showrooms and support the Company’s sales and service. 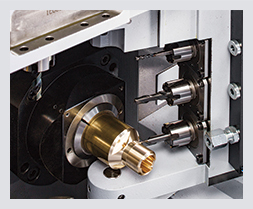 Star CNC also maintains a comprehensive dealer/distributor network. Service requests can be submitted via the form below – or call our main office in NY at 516-484-0500. Business hours are 8:30am–5:00pm, Monday–Friday. Star CNC maintains a comprehensive inventory of replacement/spare parts for all current and retired models. We know our machines are essential to the smooth operation of your business. For this reason, ordering is both quick and easy. Just complete and submit the form below – or you may call our main office in NY at 516-484-0500. Business hours are 8:30am–5:00pm, Monday–Friday. Most orders ship within 24-48 hours.